Before a crowd of thousands, and with millions more watching on television and online, the space shuttle Atlantis launched into space—and history—on July 8, 2011. The liftoff from Cape Canaveral, Florida, was the 135th and final launch of NASA’s 30-year space shuttle program. Commander Chris Ferguson led the 13-day mission to the International Space Station (ISS). His crew spent their time in low-Earth orbit performing such tasks as transferring 9,000 pounds of food and other supplies to the ISS and packing up two and a half tons of waste to haul back home. In addition, the astronauts conducted experiments (including one involving an iPhone), granted interviews to media outlets back on Earth, and even took a call from President Obama. Just before dawn on July 21, Atlantis returned safely to Earth, marking the official end of the space shuttle program. The space shuttle program lifted off in 1981 with the voyage of Columbia. Over three decades, Americans shared in the program’s triumphs and tragedies. We mourned the seven astronauts who lost their lives on Challenger in 1986 and the seven who perished on Columbia in 2003. 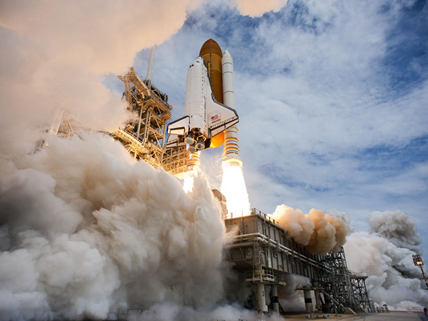 Despite these setbacks, NASA conducted many successful space shuttle missions. Besides helping build and equip the ISS, the space shuttle launched the Hubble Space Telescope in 1990. The United States is now without any means of independently sending humans into space. Temporarily, NASA will rely on paying for seats aboard capsules propelled by Russian Soyuz rockets. By 2015, private American companies may be in a position to send astronauts into space. Beyond that, NASA hopes to secure funding in order to design and test the next generation of rockets and spacecraft that could take humans to an asteroid by 2025 and to Mars by 2030. Learn about the history of the space shuttle program, the details of the Atlantis mission, and future prospects for America’s role in space exploration. Research three decades of space shuttle history and trivia. View an amazing 41-photo gallery of the final space shuttle mission. Watch this remarkable Nature video that combines footage of all 135 space shuttle missions. Listen to a 5-minute “sound portrait” recapping the history of the space shuttle program, produced by Nathan Bernier of KUT radio in Austin, TX. wow! I didn’t know the program ended! That’s unbelievable! me too i can’t believe it! Why does it have to go! Howdy I am so grateful I found your webpage, I really found you by error, while I was looking on Digg for something else, Anyways I am here now and would just like to say thank you for a remarkable post and a all round thrilling blog (I also love the theme/design), I don’t have time to go through it all at the minute but I have book-marked it and also added your RSS feeds, so when I have time I will be back to read a great deal more, Please do keep up the fantastic job. i agree. make a better decision nasa and keep us on the edge of discovery. PLEASE. i will miss NASA they will be missed by many people. i know i cant belive it i hate thoughs people who made them stop u know how many people lost there jobs? WHY DID THE PROGRAM END???????????? GAAAAAAAAAAAAAAAAAAAAAAAAAAAAAH!!! one day you say, “lets try to go to mars!!! !” the next you say,”lets just take away everything and giv up on astronological reasearch!!!!”. REALLY!!!???!? i really dislike nasa. they just GAVE UP. mabye they at least started to help with minecraft. PRAISE NOTCH! that was so epic, i am in kindergarden and need help with my astronamy and squarwe roots. any sugestions on the square roots? This is sad. Now the country that sent the first man to the moon doesn’t even have a space program. But then again, it will cut government spending, which is good. ElDo would have been a little far south to here it on this path. Several years ago one was lanidng and passed over Arkansas and it was very clear.I miss sonic booms. Growing up they were very common around here. The sound of Freedom. Asteroid Mining—Money-Maker or Starry-Eyed Fantasy?